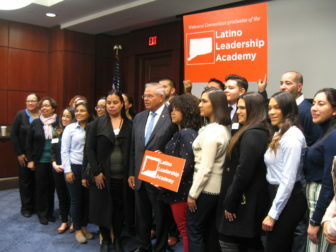 Members of the 2019 class of the Latino Leadership Academy in a group photo with Sen. Bob Menendez, D-N.J.
Washington – When Paola Esparra left Dorado, Puerto Rico for New Britain a little more than a year ago, she thought she was fleeing her hurricane-wrecked homeland for an education in accounting at Central Connecticut State University. Now her horizons have expanded and Esparra, 22, is considering a future in politics. She is one of 20 members of the third graduating class of the Latino Leadership Academy who are putting finishing touches on their political education in Washington D.C. this week. The academy is the brainchild of Sen. Chris Murphy and the Democratic caucus of the general assembly and is supported by other members of the Connecticut congressional delegation, as well. Murphy created the academy to give Latinos in the state who are involved in their communities a chance for some political mentoring and introductions to those in positions of power and/or influence. “I’ve long heard complaints about the political glass ceiling that exists for people of color,” Murphy said. He said he hoped to break that ceiling through the promotion of Latinos who have the right stuff. “They are very knowledgeable…they have passion,” Murphy said of the people who go through the academy’s program. The growth in political clout of Connecticut’s Latino community has not kept up with its population growth. More than 540,000 Hispanics live in Connecticut, and Latinos account for about 16 percent of the state’s population. Connecticut has the 11th largest Hispanic population among all 50 states. But, according to the National Conference of State Legislators, only about 7 percent of the state’s members of the General Assembly are Latinos. No member of the state’s congressional delegation is Hispanic. “We don’t have enough Latinos running for office,” Murphy said. Those attending the Latino Leadership Academy benefit from classes offered in the state that teach organizing, public policy, advocacy skills, insight into how the political system works, as well as a two-day seminar in the U.S. Capitol. It also helps Connecticut’s Democrats solidify their ties to the state’s growing Latino community, which improved its historically low voter participation in last year’s midterm elections. Murphy did not answer that question directly, but said he hopes the state will elect a Latino governor or lieutenant governor some day. Members of the graduating class asked Murphy and Sen. Richard Blumenthal a host of other questions, first a bit shyly and then with more confidence. Many focused on Congress’ intent on immigration reform. “The dilemma is whether to do it in pieces, or go for comprehensive reform,” Blumenthal responded. President Donald Trump has resisted supporting a comprehensive immigration bill, or even a slimmer one that focused solely on providing young immigrants known as “Dreamers” a pathway to citizenship. “Unfortunately I don’t think (immigration reform) will happen until 2020 and new leadership,” Blumenthal said. The senators were also asked about the Lamont administration’s failed attempt to regionalize some of Connecticut’s school districts. For Eli Mercado, 34, the goal is to be elected to the Hartford city council. Born of Puerto Rican parents, he said there’s a need for younger representation on that council. “I want our voices to be heard,” Mercado said. He said the academy has given him “deeper insights into politics” and taught him how to better run a political campaign. Meanwhile, Victor Constanza, 22, is considering making a run for mayor of New Britain. 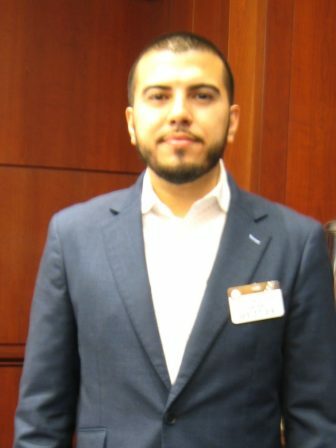 As a student in Central Connecticut State University, Constanza established CHANGE-CT, a non-profit whose aim is to help immigrants, especially the undocumented at risk of deportation. “Through my work in the community, I trained to be able to solve the problems of New Britain,” Constanza said. The academy’s students also heard, in Spanish as well as English, from Rep. Robert Menendez, D-N.J., a Cuban-American who when asked how they could best improve a political campaign, responded “work hard. They will also meet with Rep. Jim Himes, D-4th District, who grew up in Peru, and Tom Perez, chairman of the Democratic National Committee, during their stay in Washington D.C.